Having information available at our fingertips is a necessity these days. Most of us have our phone or tablet with us all the time and rely on the ability to look up, search and perform actions on these devices throughout the day. So here’s a quick tip that some of you may not be aware of – you can create a shortcut on your smart phone or tablet home screen for any sites you frequent. No more launching the browser and scrolling through to find the site you need! Open up your web browser and go to mylasso.com (or any site for which you want to create a shortcut). The web shortcut will appear on your Home Screen. You’re done and can now easily launch that site with one tap of the screen. 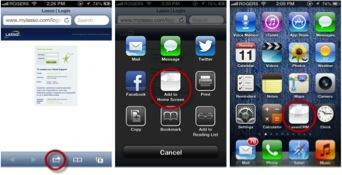 Create a shortcut to MyLasso.com easily on your iPhone. Open your browser and go to mylasso.com. Go to your Home Screen and press and hold in an empty spot. Add shortcut and you’re done!